YOU ARE HERE: THE BEST SHOPPING EXPERIENCE IN THE VALLEY! Need help? Just ask! Our information booth is located near Sobeys, just inside the main entrance. 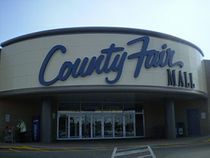 The members of County Fair Mall’s service staff are always ready to lend a helping hand, page a lost family member, provide directions, assist you with a security matter, as well as answer any questions you may have. At County Fair Mall, we aim to ensure each patron has a pleasurable shopping experience. Both of the main mall entrances are accessible by wheelchair. For a complimentary wheelchair, please visit the information booth. Are you a non-profit organization seeking to promote your group or raise funds? Visit our fundraising page to see how you can use our space to help fulfill your group’s goals. Please feel free contact us with any questions you may have. For your convenience, ATMs (automated teller machines) are located inside the full-service Royal Bank, inside the main mall entrance.